There’s something very Leslie Knope-esque I do that is annoying. From time to time, I like to ask those closest to me a question. Even though the question seems sarcastic or funny, it is what matters most to me, and I hope it’s what matters most to them. I’m essentially asking people what their passions are. Sometimes rolling out the “hopes and dreams” question isn’t the best way to go about digging in deep, because it’s so abstract. Another way to go about this is to ask the lottery question. I get that. That is a wonderful idea. You could easily fill up your days with leisurely mornings, preparing for a day on the beach. You go out to the beach. Later, sun-bleached, you go back inside and make dinner and call it quits. I push further. I want to know more. “Yeah but, what happens after that gets boring? What will you do after that?” This is where the conversation starts to get real. People shift in their seats and their eyes widen. This is the passion question. The: “If you could do anything and money weren’t an object, what would you do?” question. For the lucky people, I’ve heard responses like, “I’d probably continue what I’m doing, just remotely.” Those people are doing what matters to them, and that’s awesome. But this type of career conviction is rare. The number of people you meet who truly feel like they’re living their dream with their career are few and far between. There’s a reason why so many people are desperately searching to find their passions. Personally, I’ve gone back and forth with my answer. When I was in the midst of beauty blogging and vlogging (please don’t judge me), my ideal was to become an editor-in-chief of a large publishing house that would focus on an online blog for women that focused on self improvement, beauty, and fitness. Then I’d could hire my blogging friends and give them a place to do what they love. Even though it sounds good, and people accepted it as a valid answer, it felt fuzzy to me. I couldn’t picture wanting to run a business like that. In the past few years, I had a similar goal with design and the endless-money dream. I’d create a startup incubator to allow designers and developers to create great products. But again, that goal felt contrived. It felt like something good to say because I feel like I’m part of the design community. The thought of actually being the funder or the CEO of a startup incubator made my head spin. It didn’t feel right either. So what did the lottery winning question really look like to me? The more I -obsessed- thought about it, the less I wanted to be at the head of a corporation. The more I pictured myself in a tiny hut or a condo on a beach. Cop out? No. Because I wouldn’t just laze around the house and beach all day. In the past year, it became clearer and clearer to me what I was doing at my beach hut. I’m on a laptop. But what am I doing? Am I designing? Am I blogging? What? I’m writing. I’m in my hut on the beach, writing. My vision is clear. Adams is in the kitchen trying a cooking experiment. Or in his recording studio writing more songs. There are well-behaved kids at the dining room table drawing (we can all dream, can’t we?). My answer is writing. But it was a confusing, uncomfortable idea. Writing? I didn’t even write very often. I would only occasionally be inspired. This usually looked like this: I’d awake from a dream where I was working through an essay in my mind. Then I woke up. With the half-baked idea, Igrabbed my laptop, and headed to a coffee shop. The things I wrote were ramble-y and long. They haven’t seen the light of day. But I was starting to tap into an idea of my passion that I couldn’t even label as a passion yet. It just seemed like creative juices that needed to be released. An itch that needed to be scratched. The beachside hut is a nice thought. But when am I going to win the lottery? It’s safe to say I never will. But what I’m left with is more important. I’m left with a strong conviction that writing is my passion. Ask yourself what you would do if money wasn’t an issue. Then do it. Ask yourself this question. What would you do if money weren’t an object? 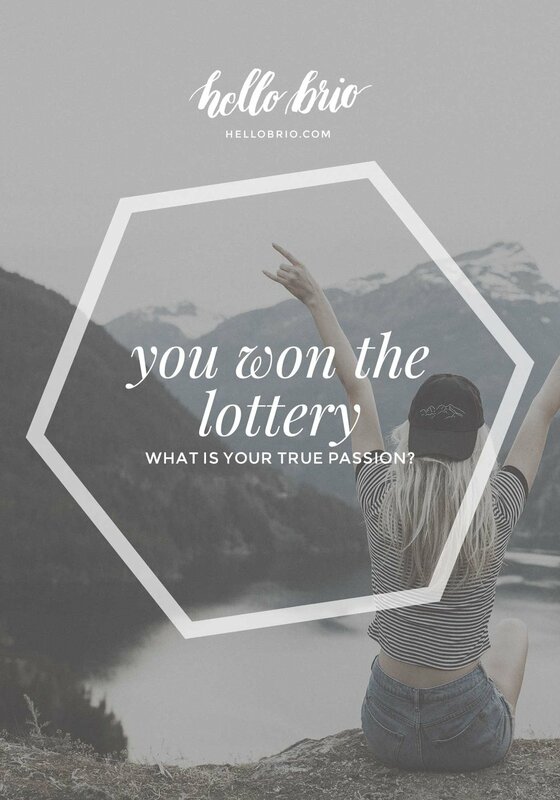 What would you do if you won the lottery and could do anything at all? Now, this is a question you may have to ruminate over for a day. A week. Even a few years. If you come across something you think might be your thing, start doing it. In any capacity you can. Your passion consumes your idle mind. Or, you completely lose track of time when you're in the midst of it. So when you think you have an idea of what it is, do it. I’m not saying to throw away your job or your current hobbies. Fit in your new thing. Make room for it. If you truly think it’s your passion, you will find a way to make time for it. By exploring your passion, you will work out kinks, find new avenues, and guide yourself further into clarity and fulfillment. Some of the passion ideas you come up with are going to be phases. You may dedicate an hour to them every day for a year and decide you actually hate it. That’s a good thing. It’s not failure. It’s you working through it and giving it the commitment it deserves. Show your work or don’t. Just make the commitment to yourself. Keep an accountability calendar. Let’s say you think your passion is fitness, and you think you want to be a fitness coach. Find a few friends that would benefit from your knowledge, and offer to train them for free. Work to create a YouTube channel with 10 minute fitness tip videos, and upload a new video one or three times a week. Work through it; just get started doing something. Do something every day related to your passion and drive into it hard. If a little down the ways you feel resistance, keep trying for a couple more months. Resistance is natural, but sometimes it can be thwarted. But, if you truly need to ditch what you thought was your passion, that’s okay. You’ve made some progress and you’ve probably made some friends along the way. You’ve gained valuable skills. Move on to the next thing. Keep pushing until something sticks. Eventually you’ll find the thing that you want to do whether people see you do it or not; whether you get recognition or applause for it. If nobody but me showed up to read my words, I would still write. If I never won an award or got published, I would still write.If I never earned a dime, I would still write. Find something you would do no matter what. Find something you would do no matter what. From there, you’re in the right mindset to continue to feel fulfilled. Maybe you’ll end up making an impression on the world with your passion. So tell me: What would you do no matter what? What would you do if you won the lottery? What are your hopes and dreams?